Despite its name, the false killer whale is not a close relative of the killer whale (Orcinus orca), and, in fact, any resemblance between the two species is relatively superficial. 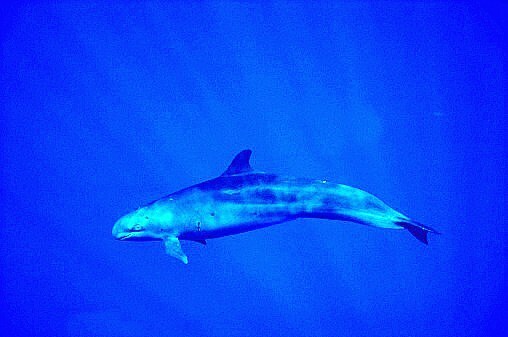 The false killer whale’s body is long and slender, with a tall, backwardly curving dorsal fin and uniquely shaped flippers that possess a large bulge at the midpoint reminiscent of an elbow. The head tapers into a long, rounded snout, which overhangs the lower jaw and is marked with a crease running above the mouthline. The jaws are armed with 8 to 11 pairs of formidable-looking, large, conical teeth, from which the species derives its Latin name crassidens, meaning “thick-tooth”. The colouration is almost uniformly black, with the exception of faint grey marks on the heads of some individuals and a whitish chest patch located between the flippers.